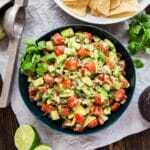 This Chunky Avocado Salsa recipe is made with a few super simple fresh ingredients and is so quick and easy to whip up last minute. You'll be making this allllll summer long! Place chopped onion in an ice water bath and refrigerate while chopping the rest of the ingredients (this will mellow the onion flavor a bit). Prep and place tomatoes, peppers, cilantro and avocado in a mixing bowl. Drain the onions and add them to the bowl. Squeeze fresh lime juice into the bowls and season to taste with salt, pepper and garlic powder. Mix well and serve immediately with tortilla chips or over your protein of choice. Leftover salsa can be stored in an air-tight container. Place a layer of plastic wrap on top of the salsa so that it was fully touching and covering the entire top layer of salsa before placing the cover on the container and refrigerating it. This should last up to a few days.